I really love playing Infinity and reckon that the core rules make for excellent cinematic game play. But I also think there is so much more that could be done with the system beyond just straight up fights. So I introduce to you Infinity: Covert Action. I:CA is a new way of playing Infinity, pitting an elite squad of specialists against the might of military or corporate security in randomised, asymmetric scenarios. The game can be played by two to six players, with one player in charge of the defensive forces (and nominally acting as the Games Master) and each other player controlling one or more attacking models, up to a maximum of five. Be aware that this is a super early version of the rules and is designed with what we currently know of N3 in mind so is liable to change once the new edition is fully released. It's probably (definitely) full of bugs, typos, loopholes, inconsistencies and imbalances. It's currently undergoing play testing but it's proving promising so far so I hope you'll enjoy it. Also, yes, there are a fair amount of rules, however the vast majority of special rules, equipment and profiles in Infinity aren't being used, which keeps the complexity fairly low. It all started on what seemed like a quiet night. There are a few more pictures after the jump. Operation: Icestorm - PanOceania finished! I've been feeling burnt out on painting for the last couple of weels. I'm sure you are all familiar with what this is like. It's a sudden switch between boundless enthusiasm - painting in the morning, evening and night, to not even wanting to pick up a brush. Every basecoat, wash, highlight and layer seems somehow more difficult than it ought to be. I'm not sure what causes it, maybe it's just a case of losing your flow. Something interrupts your painting schedule and suddenly the rhythm you had gotten yourself into is gone. Perhaps it's the realisation that you don't seem to be making any meaningful progress into your pile of lead? The worst part is the projects that get stuck in limbo. Half pained models that sit on a shelf because you lost the motivation half way through. Well, I'm happy to announce that I've managed to break my streak of painting apathy and I've (finally) finished the PanOceania starter forces from Operation Icestorm. Ready to smash some Nomad scum! Gencon is in full swing, and the latest batch of Infinity news has been made public in a seminar from CB. You can watch the seminar below, or if you are more the reading type, then I've summarised the changes that are being made. 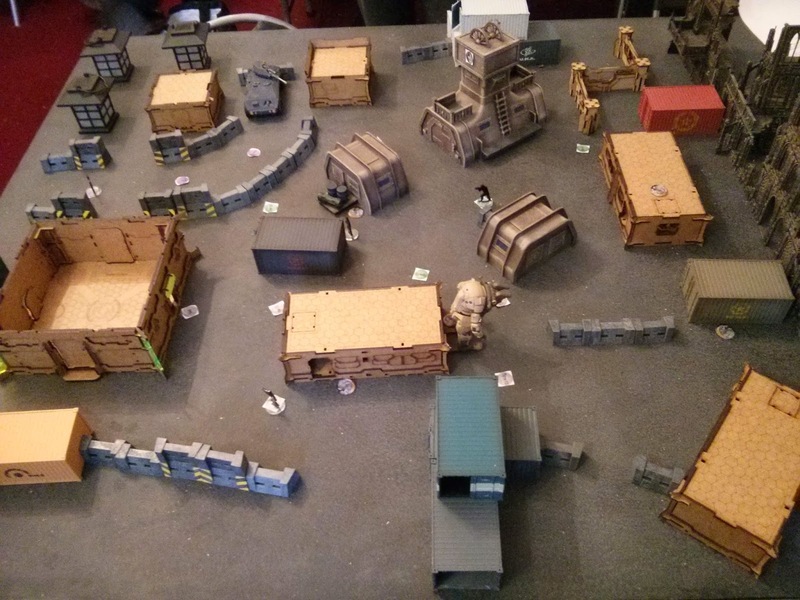 I had a fantastic weekend at Bring Out Your Lead 2014 and took the opportunity to put faces to (forum) names, view some absolutely beautiful armies and get some old-fashioned gaming done. This was my first time going as I didn't even know about the Oldhammer community this time last year and I couldn't have been more impressed with the venue, the organisation and the friendliness of the attendees. But first and foremost, a big thank-you to Harry and Paul for getting me to and from the event, I couldn't have been there without their help. For those who don't know, this year Bring Out Your Lead was hosted by Foundry at their new premises in Stoke Hall. They very kindly provided a marquee for us to play under, lots of tables both inside and outside, hot food, cold drinks and access to their shop for all three days. The Wolves skulked back onto the battlefield with heads down and tails between their legs. They made their way, many of them limping with blood staining their matted fur, back to where they were routed and their pack leader lay dead, his head caved in by a mighty blow from Fergus’ human champion. They howled mournfully over the lifeless body. As the howling began to reach a climax the old, dead wolf started to twitch and writhe. There were loud cracks as its bones began to snap and reform themselves. Its muscles and sinews began unwinding and reshaping, mass being added by some diabolic power. Its caved skull mended, spines and bony plates sprouted from its back and sickle-like growths sprouted from newly formed tails. The wolf-thing rose shakily up on all fours, now much bigger than its companions, and released a gut-wrenching bellow loud enough to panic the Skaven who were busy looting the dead nearby. Gorehowl had risen. Welcome to part two of things I've been dying to discuss. I've been scouring through Icestorm in order to get a glimpse of what is to come from Infinity N3 and have some pretty juicy things to share. Please take everything here with a pinch of salt however; a lot of the rules in N3 appear to be slightly simplified for the purposes of a new player experience and only reference abilities and interactions that the models in the box can have with each other. As such, there may be further tweaks, clarifications and expansions on these rules with the release of N3 later this year. Note that all images are taken from material published by Corvus Belli, they are not my own work. With the disclaimer out of the way, let's dig in and see what we can learn! I've been absolutely dying to tell people about this, but Corvus Belli requested that we don't disclose any pictures or contents of Operation: Icestorm until 1st August (fair enough, really). But that day has finally come! Colleagues: There's got to be a lot in there?! Turns out, it was a copy of Operation: Icestorm that Corvus Belli generously let me buy early for the purpose of running demo events. What's this? A Package? For me?